We offer tables in a variety of shapes, sizes, and custom features to meet your decorating and dining requirements. Made in U.S.A. from the best quality materials by American craftsmen and built to withstand residential and heavy commercial use. 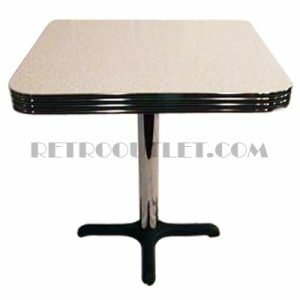 All of our retro tables are available in a wide variety of laminates, metal banding sizes, and several different base options, leaving it up to you to create a table you will love. These vintage style tables are a great choice to use as kitchen or dining tables, all available at the best prices you will find on the internet.